Because of production problems, Sony is behind schedule in producing dual-lens camera modules for Apple, which may turn to LG to provide the majority of initial modules for this year's 5.5-inch "Plus" iPhone, a research analyst claimed on Friday. "iPhone 7 Plus" dual camera design mockup by Feld & Volk. Sony may not be able to meet its target quota because of "lower-than-expected" yields, plus damage to a production facility caused by April's earthquake in Kumamoto, said Nomura Securities' Chris Chang in a memo cited by Barron's. As a result, another regular Apple supplier —LG Innotek —could claim the majority of Apple's first-wave orders, he said. Chang additionally suggested that all of Apple's upcoming 5.5-inch iPhones will use dual-lens cameras, and that people buying regular 4.7-inch models won't be left out in the cold. Those phones will come equipped with optical image stabilization, something previously reserved for "Plus" devices, the analyst predicted. Optical image stabilization, or OIS, is a marked improvement over software stabilization, and can significantly reduce the blurriness of images shot in action or low-light conditions. 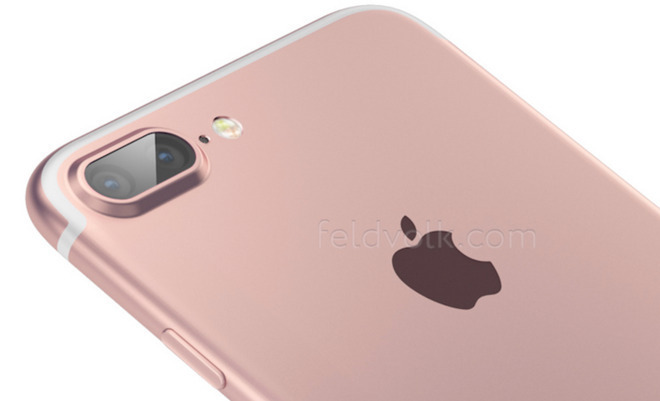 Suppliers are reportedly gearing up to ship the "iPhone 7" and "7 Plus" by the end of September, in keeping with Apple's usual iPhone launch schedule. The camera situation could potentially throw a monkey wrench in those plans, causing a delay or hampering launch inventories. On top of a dual-lens camera, the "7 Plus" might also upgrade to an "A10" processor, 3 gigabytes of RAM, and a Smart Connector.